Do the patio doors you have in your home fit your needs? When you purchased your home, you may not have given a lot of thought to the style and type of doors you had, but, there are a number of things to consider if it’s time for replacement patio doors. This article will focus specifically on sliding glass patio doors and how to find the best one to suit your home. From wood to aluminum, fiberglass and vinyl, each material type can help provide a grand entrance to your patio and help you achieve your goals for outdoor living. Do I want to retain the original size of my current patio door or expand the opening for increased daylight or air flow? How important is durability and ongoing maintenance? Am I looking for increased energy efficiency? Is color important to me? Identifying the elements that are important to you is an important first step. Now, let’s look closer at patio door materials to help you narrow down your options. Vinyl sliding glass doors are a great solution for either replacement patio doors, or new construction. Sliding doors work well in tight spaces or situations where your furniture is close to the door, whereas swing doors need the area clear for the door to open to the inside or exterior. Vinyl looks beautiful on a variety of architectural home styles and can even be ordered with a painted frame color for additional design flair. Vinyl is also exceptionally energy efficient, durable and requires very little maintenance. Wood sliding patio doors provide a traditional design style, due to their wide frame profiles. The interior wood color can be stained to match your existing furnishings or you can paint them any color you choose. Because wood is a natural material, some ongoing maintenance will be required to retain the stain, finish or paint color you choose. Milgard wood patio doors actually have a fiberglass exterior, paired with the wood interior, for great protection against weather elements. In addition, there are 16 exterior colors available from Black Bean to Evening Sky. Fiberglass sliding patio doors are extremely strong and low maintenance. They are durable, energy efficient and can add a touch of elegance to any home. Milgard offers a fiberglass French-style sliding patio door in seven exterior frame colors to match your home beautifully. The interior colors are white, or, choose to match the interior and exterior frame colors when you select Black Bean, Bark or Harmony (shown in photo). 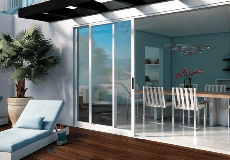 Aluminum sliding glass patio doors can give your home a contemporary feeling. If you are remodeling, consider adding sidelights and transoms for additional light and ventilation to create a wall of windows around your patio door (see photo). The narrow frames and clean lines help you maximize your view and the strength and stability of aluminum make it a great choice for replacement or new construction projects. Glass walls are really stunning and have been gaining in popularity due to their ability to help expand living areas. They come in three operating styles: Bi-Fold, Pocket, Stacking, and each has its benefits, depending on how you plan to use the space. For example, the panels of a pocket door completely disappear from view when the door is fully open, because they tuck into the wall itself. Bi-Fold doors are bottom, instead of top loaded, which works well for remodeling projects when you don’t want to add a structural header to carry the doors weight. We would love to know more about your project and which sliding glass patio door is your favorite. Leave us a comment below. If you need more inspiration, download our free guide with “6 Essential Tips for Choosing New Patio Doors”. Thanks for letting me know that vinyl sliding doors look nice on architectural home styles. My husband and I just moved into a new house. We want to replace the back door, so maybe we'll use a vinyl sliding glass door. I liked that you talked about different kinds of glass doors, and I loved the vinyl sliding glass door and the fact that it fits best in smaller places where the furniture is closer to the door. I've been wanting to remodel my house and glass doors are a must in our living room! I loved the vinyl doors so I'll make sure to look more into them, thank you! I just built a patio so I want to install a sliding glass door for it soon. I like your point about how aluminum patio doors have a narrow frame that lets you maximize your view space. I'll definitely consider this option so it's easier to see the whole yard from inside. My husband and I have some sliding doors on our home that connect to the patio but recently they've been getting stuck, and we're thinking of repairing or replacing them. Your article had some great information regarding this, and I liked how you said to consider aluminum sliding doors as these are strong and stable, and their narrow frames maximize our view. Thanks; we'll keep this in mind when getting sliding glass doors. It caught my attention when you said that vinyl glass doors require very little maintenance and durable. As you said, they are energy efficient too. My husband and I are interested in having a patio glass door installed for us. We want to make sure that we can separate the exterior part of our house from the indoor part without negatively affecting the aesthetic appeal of our house. We'll be sure to find a glass door company that offers vinyl glass doors so we can save money on repairs and replacements in the long run.